John Madden once told NFL Films “Cliff Branch was so skinny when he walked his back pockets would fight.” Yet no one put fear in NFL secondaries when it came to getting beat deep during the 1970’s. When someone says close your eyes and picture the Oakland Raiders of the ’70’s, one of the first visuals you’d have would be Stabler launching a bomb in Cliff’s direction. Drafted out of Colorado in 1972, Branch was a football and track star in college. Oakland had been without a true deep threat since Warren Wells departure a few years earlier. His baptism by fire would come as he learned the game from Hall of Famer WR Fred Biletnikoff and going up against Hall of Fame CBs Willie Brown and Skip “Dr Death” Thomas in practice. Going against those 2 big physical corners, Branch grew up in a hurry. When he was unleashed on an unsuspecting NFL as a 1st time starter in 1974, Branch blazed for 60 rec 1,092 yards and 13 TDs. Pedestrian by today’s standards until you realize he was 4th in receptions and led the league in yards and touchdowns. It was the 1st of 4 straight Pro Bowl and All Pro seasons. He was the #1 weapon on a team that finished in no less than the AFC Championship in each of those campaigns. His best season capped off the Raider’s Super Bowl XI championship when he caught 46 passes for 1,111 yards and 12 touchdowns. Why was it his best? He led the league in TDs and was 2nd in yards losing to Roger Carr by 1 yard on arguably the most powerful NFL champion of the 1970’s. One aspect of Branch’s game that makes him an all timer is how he played in big games. When everyone marveled at Hall of Famer Jerry Rice as he was breaking all time NFL post season records, whose records did you think he was breaking? When Rice caught 3 TDs in Super Bowl XXIV, he was breaking the Super Bowl record for touchdowns in a game when Branch set it with 2 against the Eagles in XV. When Branch retired after the 1985 season, he was the NFL’s All Time postseason reception (73) and yardage (1,223) leader before Rice broke them some 9 years later. 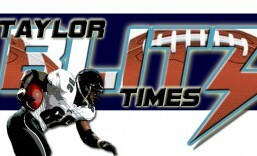 He had broken the previous records set by fellow Raider WR Biletnikoff, who was now his coach. However records and numbers only tell a part of the story. How much space did defenses give him in respect to his speed that opened up opportunities for Biletnikoff and Hall of Fame TE Dave Casper?? Do you realize he was the only skill player on all 3 Raider Super Bowl champions?? Against the Eagles in Super Bowl XV it was his 2 scores that broke the game open 21-3…winning it 27-10. In Super Bowl XVIII when the Raiders held a precarious 7-0 lead over Washington it was Branch who blew that game open too. The Raiders first score was a blocked punt. 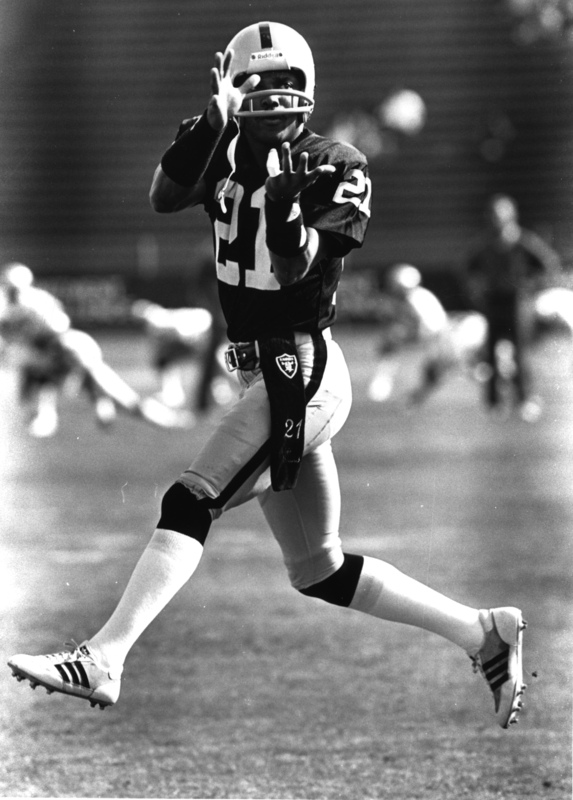 In the 2nd quarter, a 35 year old Branch beat Anthony Washington and Darryl Green on a 50 yard bomb to put the silver and black in scoring position. A few plays later Branch scored from 14 yards out to give the Raiders a 14-0 lead. This took John Riggins out of the game and forced the Redskins to pass into the teeth of a secondary led by Vann McElroy, Lester Hayes, Mike Haynes, and Mike Davis. A 38-9 triumph won him his 3rd championship ring. For his 14 year career he caught 501 passes for 8,685 yds and 67 touchdowns. His fellow receivers Biletnikoff and Casper have each made “The Hall.” This August his original quarterback, Ken Stabler will be enshrined posthumously. His original coach John Madden and the late Al Davis have both been enshrined. Once Tom Flores and Cliff Branch are voted in, it will close this chapter on Oakland /L.A. Raiders football. For enshrinement into the Pro Football Hall of Fame, I present to you Cliff Branch. Al Davis said he wanted a ring so nice that he wanted a Raider to be able to meet the Queen of England and not feel he had to take it off. Mission accomplished!! 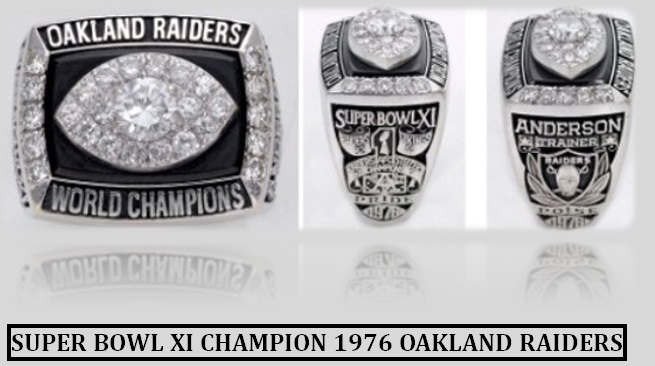 One of the unique features to every Raider championship ring is that Al Davis uses the AFL “A” and not the AFC “Block A” on the side. 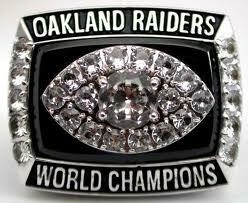 This was the bauble for winning Super Bowl XI on January 9, 1977 over the Minnesota Vikings 32-14. They finally clutched the prize, Madden, Stabler, Biletnikoff, Tatum, Hendricks, Matuszak, Sistrunk, Villapiano, Atkinson and Raider Nation. What is strange is how the Raiders could have totally written sports history. They played in 5 other conference championships before winning the Super Bowl in 1976. That’s without talking about the “job” they got in the Immaculate Reception in the 1972 AFC Divisional playoff that would have put them in a SIXTH. I cornered Franco Harris in 1991 and tried to get him to exact the ball hit Fuqua and not Tatum and he wouldn’t do it!! sigh…yet I digress After playing in Super Bowl II, the Raiders could have been in Super Bowls 3,4,5, 8-10, & 12. So this was the culmination of pushing to be the best over all those years. Yet stop and think about how history could have been written had they won those games. The Raiders would have played the Vikings in Super Bowl IV, who was the original AFL team to be in Minnesota, until the NFL undercut the AFL by giving the owners of that territory an NFL franchise. This is ironically how the AFL got to Oakland in the first place. They would have stopped Johnny U. and the Colts from making the “Blunder Bowl” or Super Bowl V and could have been going for a threepeat. Had they won in 69 and 70 it would have made them the last AFL Champion as well as the first AFC Champion. They would have stopped the Dolphins from being a dynasty by keeping them from winning back to back Super Bowls. By the way, remember the undefeated 1972 Dolphins and their record 18 game winning streak? Who did they lose to? The Raiders in early 1973 in a game played at Berkeley because the A’s were in the World Series. Footnote this with it was the Raiders who in the ’74 Divisional playoff, the “Sea of Hands” play stopped the Dolphins from going to 3 Super Bowls in a row…so this isn’t far-fetched folks. They would have stopped the Steelers dynasty from taking off (Super Bowls IX & X) and would have been crowned team of the 70’s by this time easily. Don’t start Steeler fans because these were some battles with the Raiders. They would have stopped the Broncos miracle ’77 season keeping them out of Super Bowl XII. As for the team that always threw deep, I find it ironic that the Super Bowl XI MVP was a supposedly slow, couldn’t get deep, that left the NFL as the leading playoff touchdown in receptions and yards before he left in 1977 and that is Fred Biletnikoff. My man was busy cookin’ the best that the NFL had to offer at CB. It was understood when the game was on the line they went to the diminutive route runner from Florida St. Fred Biletnikoff had only 4 catches in Super Bowl XI, yet those catches set up 3 Super Bowl scores, and was the focus of why the Raiders blew out the Vikings in Super Bowl XI. He was a tremendous performer and the predecessor of Lester Hayes’ use of stickum in 1980. He was the all time post season reception leader and yardage when he retired. Who broke his record? Cliff Branch…the man he showed the ropes on being an NFL receiver. Jerry Rice eventually broke these records but you have to appreciate how things became the way they are. Now Raider fans, you guys have to let go of the Immaculate Reception as I had to after several beers with Franco. You did get jobbed and that ’75 AFC Championship Game icy field in Pittsburgh was fair when you guys played head games with the Chiefs and others about leaving the water on all night, hence the wet field. It’s just gamesmanship. OK then you guys got robbed in Denver on Lytle’s fumble in the 1977 AFC Championship game….ok maybe there is somethin’ to it. The tuck rule with Tom Brady and the Patriots in 2001…damn you guys are on to something!! Just keep in mind you have had your share of calls also.